3919 Moran Road at 8 p.m. Lt.
East. In 1978, he was the U.S.
were asked "what time is it? per mile or a flat contribution. is 875-8287. Join in the fun! are as excited as can be! on dollars-pledges that we have received," continued Kessler. cies. In order to avoid a similar happening, we must raise more dollars. counted along with those who have already made their campaign commitment. and around the world depends on your response to this appeal," stated Kessler. Horatio Street, Tampa 33609 875-1618.
senior at Plant High and will attend Dartmouth in the fall. the Jaycees Service Club and is a Tribune Honor Student. pole vaulter on the track team. and chief executive officer of Florida Steel Corp.
majoring in business. Good luck to you both! Norma and Albert are beaming these days. Rudolph; third baseman Lauren Stein, daughter of Dr.
i. Way to go, girls!! Weissman and the late Howard Weissman, St.
leave from Bunzl-Tampa, a paper and plastic distributor. campus in New Haven, CT.
We also do bar mitzvans. Reunions. Birthday bashes and black tie balls. And we do them all with experience and elegance. make your special day a day to remember. Call 873-4400 for more information. Your check payable to the Tampa Jewish Federation is your reservation. Share the Tampa Centennial Celebration! card average of 114 percent. specific needs of these groups. Donor, $75; or Patron, $100. Jewish Family Services, 112 S.
fluffy, all natural borekas come filled with creamy cheese or spinach. Bring some joy from the old country to your table with fal sin. I ISRAEL! new kosher pleasures from Empire. another veteran of the school. help me if I were a student?" and does socialize with them. ing recess and loves gym class. that "Hillel is a good school." FUN!" I couldn't believe it. junk food for the school!! I felt as if I had been set up. school for different age kids!" which she "sort of does well." to me: "Can we talk?" didn't ask me about clubs..."
So here's Sara on clubs. play ... I've got lots of lines!" 1. Pay attention in class. right they don't yell at you. at the hands of the Nazis. the children I spoke to! ing evidence to the contrary,"
grade at the Hillel School. May be the school for you. I seniors, $17 per family. activities by the pool and beach. live music, cash bar and hors d'oeuvres. Hour, 10 workshops and a brunch with a Keynote Speaker. Closing statements will take place at 3:45 p.m. Wealthy, Cummunicable Diseases and the Single lifestyle. Circumstance, Politics of Israel, and Hassage Therapy. --- INVITATIONS WILL BB FORTHCOMING --- . match service will be available through the Singles Council. JCC logo and personalized with your campers name. Order now for best color selection!! friends. Music. Arts and Crafts, and RE. activities will be included. TIME Monday, Wednesday, Friday. 9OO12O0 pm. ai the Main Branch only. 'All Stioraahim camp groups mutt neve a minimum ol 12 campers. Parents will be notified by May 1,1987 if Camp groups are not meeting. \u Mtp Fees f on au caukhs must ae mo in full by june i mr.
2 W^L^? "8- ***** *" I ""*" -" "UniCllon* mIiim. Ju<>*c pro,,***,. * iCA*,""*'oa*uc**ia#usTacnoi* PUU aVJMI istr. tivities, dancing, Judaica, Karaie and tennis. ability and understanding of the camping experience. maturity necessary to contribute to and benefit from this program. Florida and Ocala National Forest. This program is only available for JCC members. Week-long activities of camping and hiking In the Ocala National Forest and Ocala National Trail. ing the old and new In St. Augustine Enjoy a "whale" of a trip to Marineland on Thursday. forts of the home's Guild. atAa i Be .fnf aa: a.
living in Israel for 10 years. took place at Town Hall, New York City. to the residents of the home. ing of self worth," said Mrs.
you," that is payment enough. COACH J. I. MONTBOMEJIT. C.C.D. "Everything Homemade In Our Kitchen"
Jewish Home Cooking... There's Nothing Like It. and Marvin Okum, New York. with Ameet's name added to the list of previous achievers. Well done, President Honey Minkin, and her members. become members of Kol Ami. Glad to have y'all here!! All Mies include our exclusive on-aite warranty. Schneider; aunt and uncle, Mr.
Mr. and Mrs. Al Fine of St. Boy Scout and a piano student. friends from out of town. Julie Tindell, Jill Hanan, NUi Peled and Jennifer Charles. Hilk, Robyn Pegler. Front Row: Shana Levine and Avi Berger. Saturday, 9 a.m. Daily morning and evening minyan, 7:30 am., 5:45 p.m.
Farber. Services: Friday, 8 p.m.; Saturday, 9:30 am. evening 7 p.m.; Saturday morning 9:30 am. day of each month. Masonic Community Lodge, 402 W. Waters Ave. (at Ola). P.O. Box 271157. Rabbi Yossie Dubrowski, Executive Director. 963-2317. Friday night Services one half hour after sunset. Tuesday night rlsiscs at 8 p.m.
B'NAI B'RITH HILLEL FOUNDATION at U.S.F./U.T./H.C.C. evening 7 p.m. Sunday Bagel Brunches, 11:30 am. study discussion sessions. "Shabbat Experience," monthly services and dinner. Waters Ave., Tampa, at 8 p.m.
Lodge, 402 W. Waters Ave.
What Time? 11 a.m.-3 p.m.
Student, and the Harold S.
be presented to each student. are from the Tampa Bay area. ment of the Jewish people"
for the past 75 years. Cost of the luncheon is $4. the woman of the eighties. 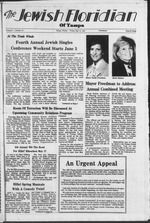 and the National Council of Jewish Women. many in their time of need. detail in his own personal and compassionate manner. Charles Segal always there as a friend. Pan Am Holidays at 1-800-458-1233.
limited. $100 discount offer is good through 6/15/87. Book available while supplies last.